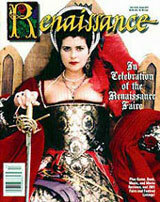 Renaissance Faires: Renaissance Magazine Offer! Renaissance Magazine is proud to announce the first annual Renaissance/Medieval Directory! If you have any questions about the NEW Renaissance/Medieval Directory or advertising, contact Lady Janet at (800) 232-2224 or ladyjanet@renaissancemagazine.com. The Directory is available for $29, but will be sent FREE to all Renaissance Magazine subscribers. Subscribe to Renaissance Magazine and receive a special subscription rate. This is a limited-time offer, so act quickly to take advantage of these special savings! !